The masterpiece was purchased in 2017 by the Crown Prince of Saudi Arabia as “one of fewer than 20 known paintings by Leonardo. Subsequently, it was promised to the Louvre Abu Dhabi as the emirate’s “gift to the world.” The staff at the museum is now saying that they have no knowledge of the painting’s whereabouts, and no one has seen it since it was purchased by the Crown Prince. It leads the art world to wonder, did Crown Prince MBS decide to keep this pricey trophy to enjoy privately, or are recent questions of attribution keeping it out of public view? 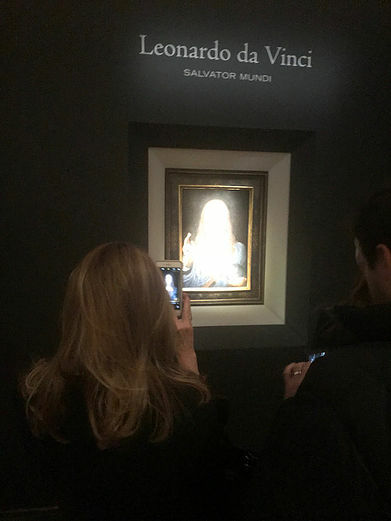 Soon after the painting sold for a record-breaking $450 million, a leading Oxford art historian and Leonardo scholar, Matthew Landrus, claimed most of the painting is by the artist’s studio assistant Bernardino Luini. His work generally sells for less than 1 million. Other leading experts have concurred with Landrus. Sources say that even some Louvre staff also have their doubts, and have declined to comment publicly. Now the question becomes two-fold: Not only, Where in the World is Salvador Mundi? but Who in the World (Actually) Painted Salvador Mundi? Those who love art are longing to know.